« Fall is almost here!!! Merry Christmas! I’m actually updating my News Page on Christmas, just before I leave for my sisters house in Hamilton. What a beautiful day, with the fresh new fallen snow and the sun shining!! It will be a wonderful celebration. I hope your Christmas and holidays are wonderful too!! This season there are new birthday options on the rack, a new Christmas card of course!! A new holiday thank you and flower, a new Thoreau card, a butterfly and a new anniversary. On the drawing board are more birthday options, for kids, a new valentine naturally, a new bird, maybe a new cat and the wedding one I’ve been promising! 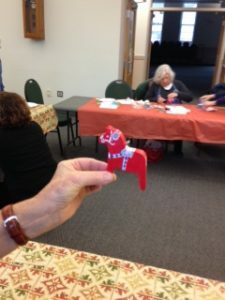 I taught a class in December, the Swedish Dala horse at the Concord COA, which was well attended and very fun. 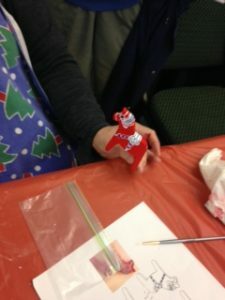 Everyone made a beautiful horse, I was impressed! Here are some examples of the students excellent work!! I have purchased a new binding machine, so I can make my own journals. 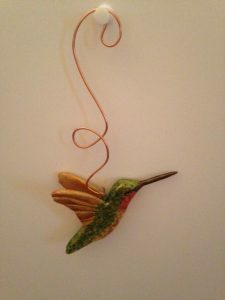 I know they will be available at Firefly and Verrill Farms and on line, more on that as it developes. This was another banner year for me selling cards and I have you to thank for all the support! 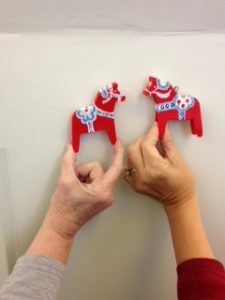 I am always amazed that I can sell so many cards in just a few towns, thank you very much for your patronage! !